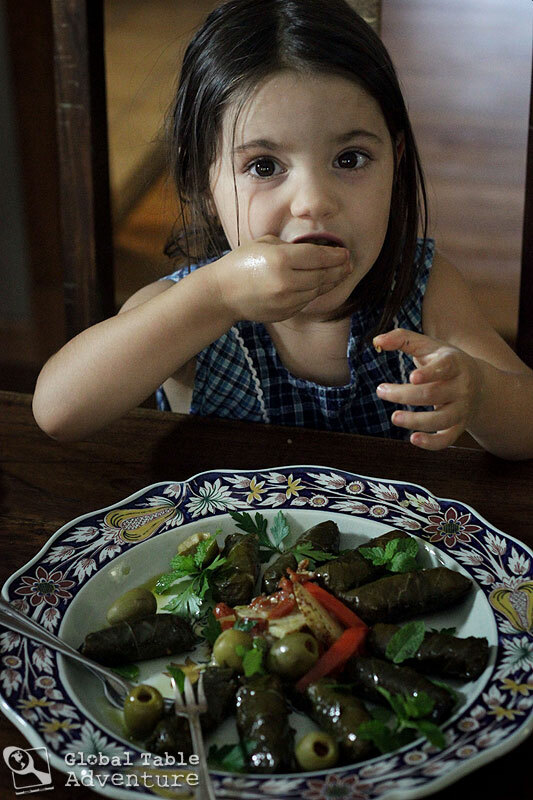 Time and time again I’ve failed to entice Ava with stuffed grape leaves. 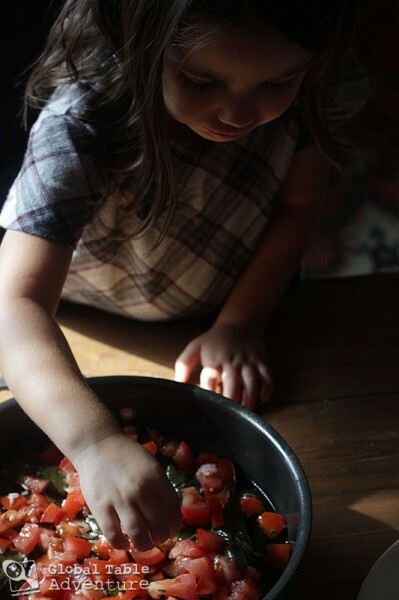 I tried back when we cooked Armenia, when the grape leaves were laced with an intoxicating blend of cinnamon, allspice and currants and she was an innocent, unquestioning 8-month old. Let’s just say she wasn’t ready – neither for the somewhat chewy outer “skin,” nor the mystery of what was inside. Little kids like to know what mom is feeding them. Not one to give up easily, I spent the last 3 years casually pushing them onto her plate whenever we stopped by the Whole Foods salad bar for a quick meal. 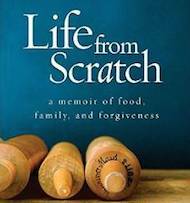 Even with her astonishing love of salads and most any stout vinaigrette, Ava consistently turned her face away from the dark green dolma, dove her fork into a festival of lettuce and munched away without an iota of interest. But here’s the thing. I can’t leave well enough alone. For some ridiculous reason I want – no need- my daughter to love stuffed grape leaves. 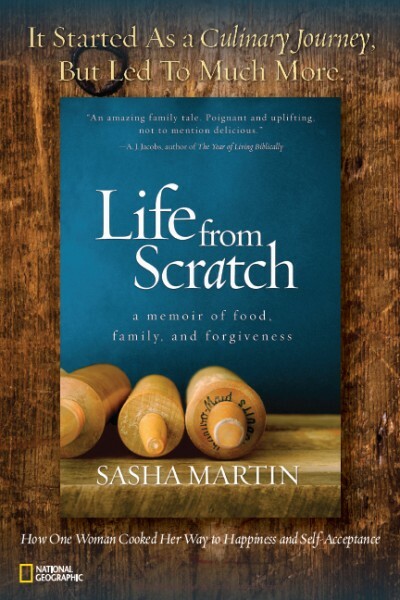 I suppose it is the same something that made me hope against hope that she would love homemade sushi, sticky rice towers, and foe (Laos’ cousin to pho): a wish for her to enjoy interesting food and therefore, be an interesting person. Also, I want her to know that, when it comes to food, the risk is usually well-worth her bravery. Thankfully, Ava does love all of those things.. sushi, rice towers, and foe. 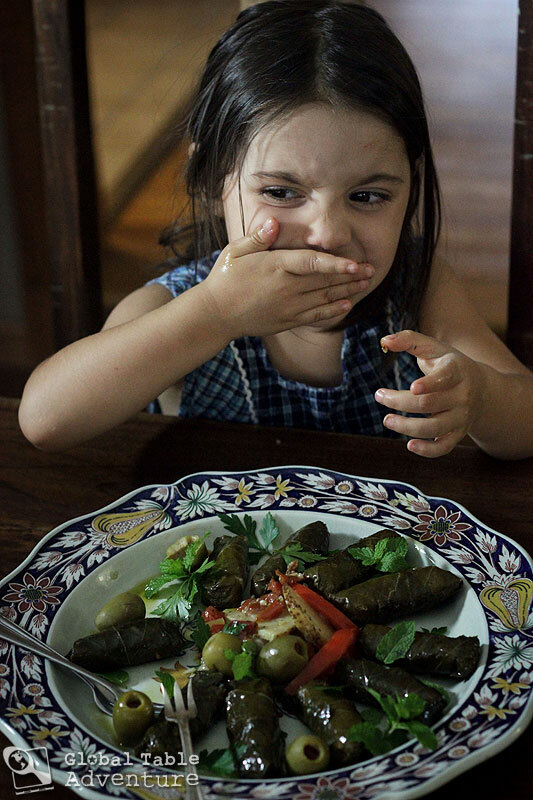 For this reason, I was simply baffled as to why Ava didn’t love grape leaves. She helped make all those other dishes. 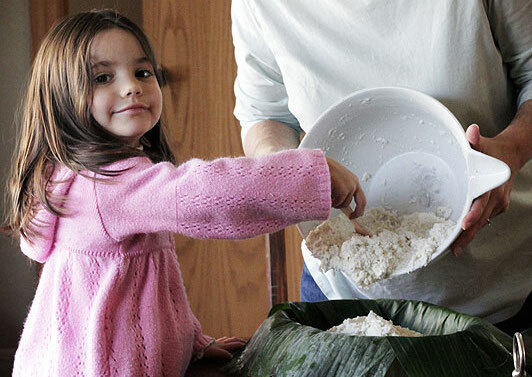 She had her elbows in the bowl, mixing and wrapping, shaping and smashing. It was fun and she always ate the results. I realized Ava never had the opportunity to stuff grape leaves at my side. And like that, I knew what to do. 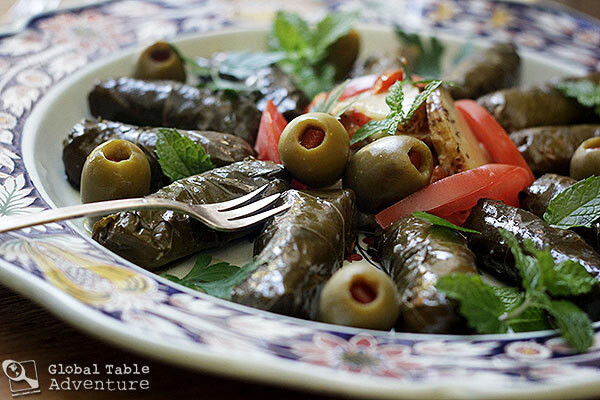 A perfectly stuffed Arabian grape leaf is a thing of beauty, and this version can be found throughout the Gulf. After slowly simmering in a bath of olive oil and lemon juice, she’s plump, tart and silky rich. 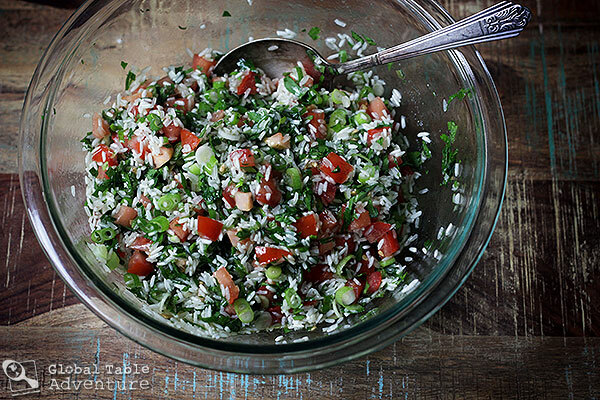 Inside is a glory of rice, laced with fresh mint and parsley, and a smattering of tomatoes and green onion. What’s not inside? 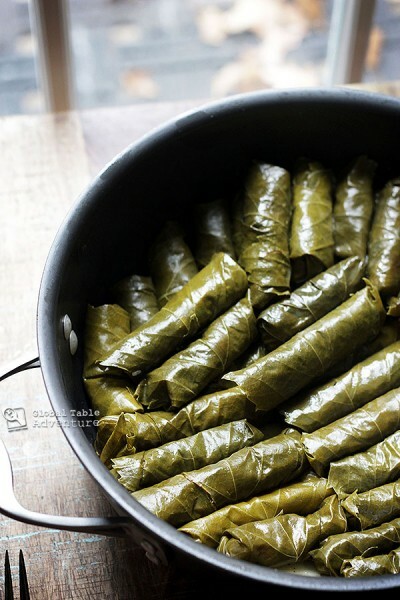 The lengthy-lettered preservatives and flat flavors that jarred grape leaves offer. 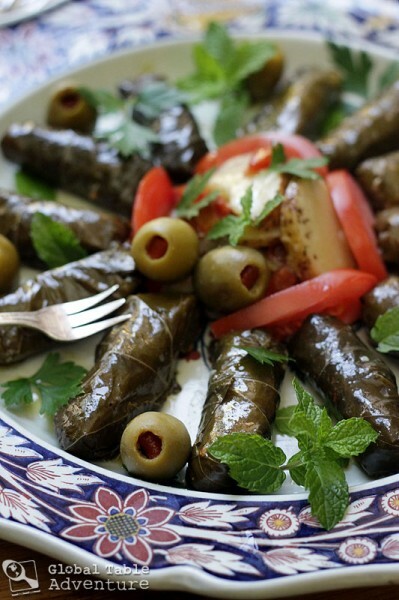 Ask anyone in Qatar – stuffed grape leaves must be made with loving hands, not purchased. And that is exactly what we did, and hope you get a chance to try sometime soon. 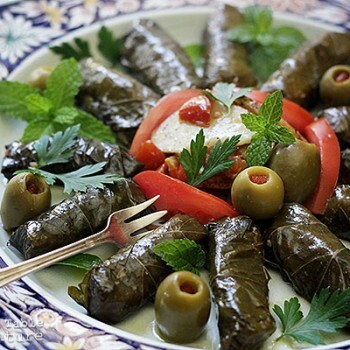 It can be served at room temperature and is called waraq inab bi’l-zayt (grape leaves with olive oil) or it can be served hot and is calledwaraq inab (grape leaves). (Personally I enjoyed them room temperature and hot, so the choice is yours). Let’s build something together. Something healthy, but indulgent. Strong like stone but made with grape leaves. Qatar University campus. Photo by Sky2105. For the insides, mix together a fresh collection of rinsed but raw rice, tomatoes, green onion, mint, parsley, olive oil, salt and pepper. Most recipes have you cook the rice ahead of time, but I found some that use raw rice and love how it eliminates several steps and dirty dishes. 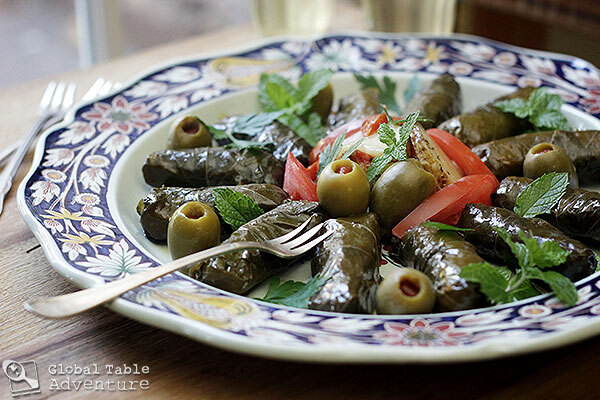 Now all you need to do is wiggle those stubborn grape leaves out of the jar and begin wrapping them up. To do so, place leaf backside up and place a small spoonful of filling by the stem end. Begin to roll the leaf from the stem end. After about one roll, fold the left and right sides in. It’s like wrapping a present, but tastier. … and continue rolling. You don’t need to make them super tight because the rice needs room to expand as it absorbs the liquid. Add potato slices to bottom of pot. Then add the grape leaves. Stack them tightly together, making one neat layer on top of another. Keep rolling and rolling. Meanwhile, hum a little tune. (Thanks, Brian!) What a glorious sight. Next, top with tomato slices. Pour on the olive oil and any juices at the bottom of the bowl that held the rice. Cover with a plate to keep the grape leaves from floating and unrolling, then top off with a lid. Simmer gently for about one hour. This will allow the potatoes at the bottom of the pot to get a nice crust. 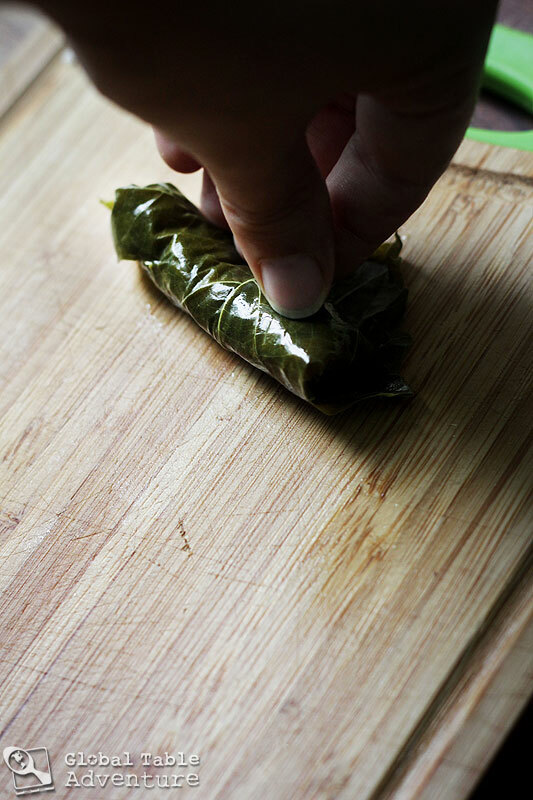 Then add the lemon juice and cook an additional hour (or to taste)… you’re looking for the rice to be tender inside of the grape leaves… (cut one open to check). I’ve seen several recipes cook them for upwards of three hours, so don’t despair if yours needs longer. 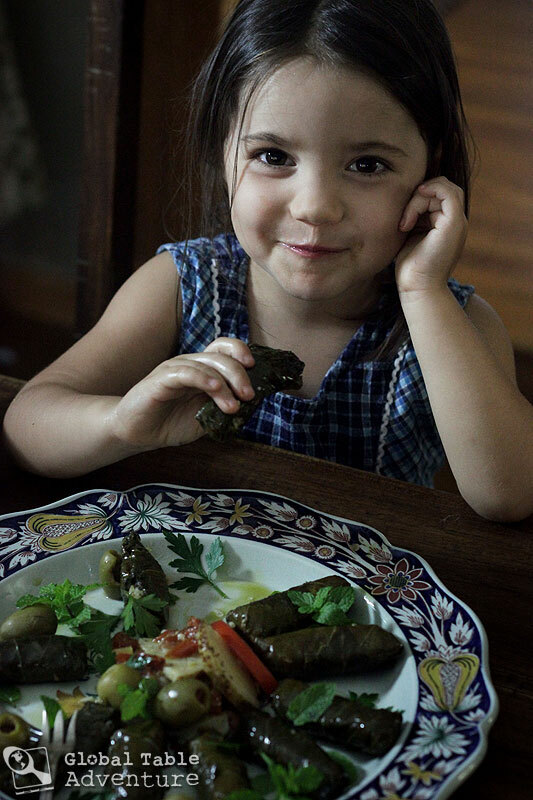 As we were working, this child could not keep her hands off these grape leaves. And once it was cooked? She actually nibbled the real deal. Arrange them on a plate (this is about 1/3 of them) and pile some of the lemony potatoes in the center. Garnish with the cooked and sliced tomatoes, as well as a few olives. I wish I’d had some black ones, but these were delicious as well, if not quite as authentic. Here’s the final verdict from Ava … you be the judge. 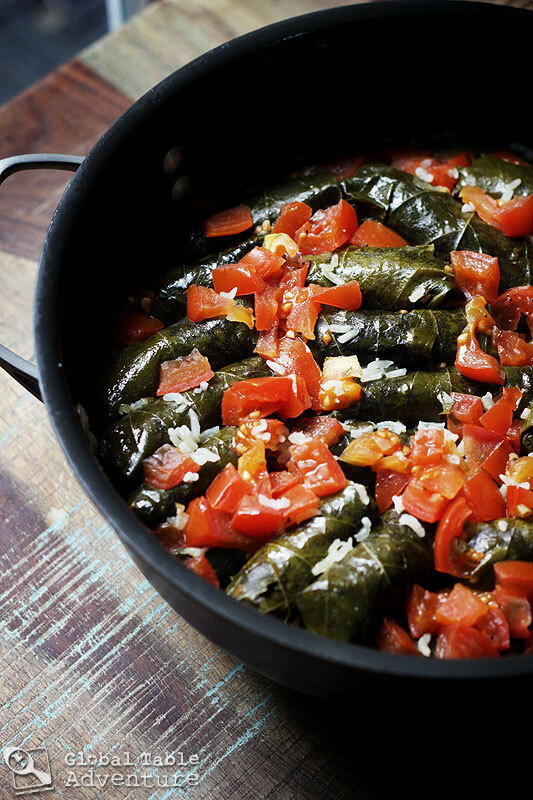 I hope you get to make stuffed grape leaves with someone you love very, very soon. 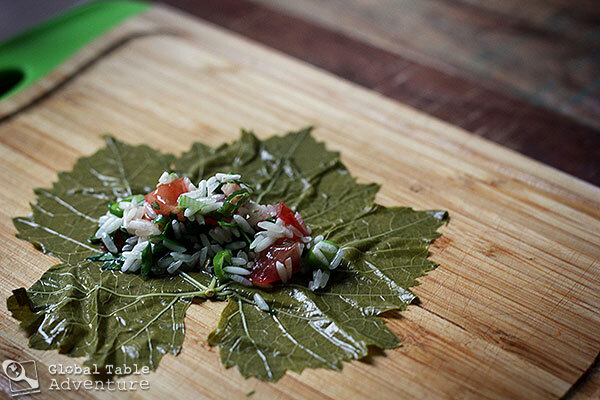 A perfectly stuffed Arabian grape leaf is a thing of beauty, and this version can be found throughout the Gulf. After slowly simmering in a bath of olive oil and lemon juice, she’s plump, tart and silky rich. Inside is a glory of rice, laced with fresh mint and parsley, and a smattering of tomatoes and green onion. What’s not inside? 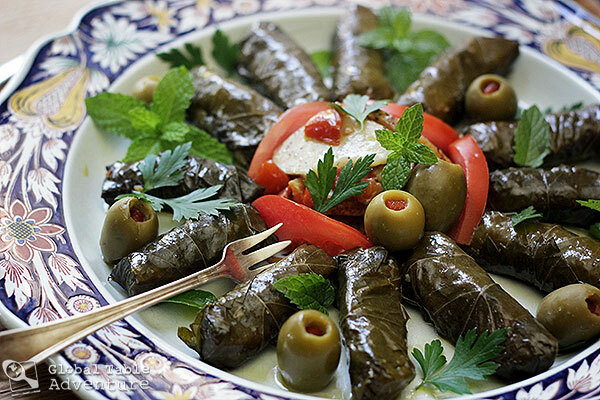 The lengthy-lettered preservatives and flat flavors that jarred grape leaves offer. 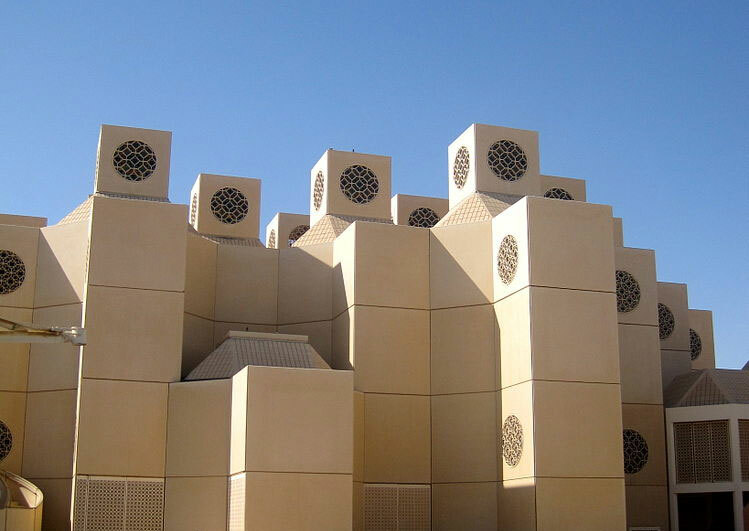 Ask anyone in Qatar – stuffed grape leaves must be made with loving hands, not purchased. And that is exactly what we did, and hope you get a chance to try sometime soon. For the insides, mix together a fresh collection of rinsed but raw rice, tomatoes, green onion, mint, parsley, olive oil, salt and pepper. Now all you need to do is wiggle those stubborn grape leaves out of the jar and begin wrapping them up. 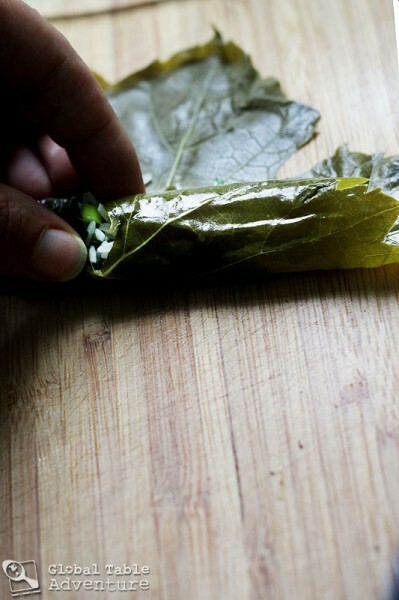 To do so, place leaf backside up and place a small spoonful of filling by the stem end. Begin to roll the leaf from the stem end. After about one roll, fold the left and right sides in. Continue rolling. You don’t need to make them super tight because the rice needs room to expand as it absorbs the liquid. Add potato slices to bottom of pot. 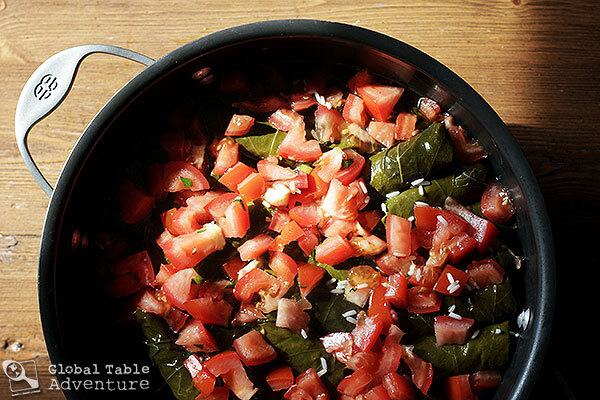 Then add the grape leaves. Stack them tightly together, making one neat layer on top of another. Keep rolling and rolling. Next, top with tomato slices. Pour on the olive oil and any juices at the bottom of the bowl that held the rice. Cover with a plate to keep the grape leaves from floating and unrolling, then top off with a lid. Simmer gently for about one hour. This will allow the potatoes at the bottom of the pot to get a nice crust. 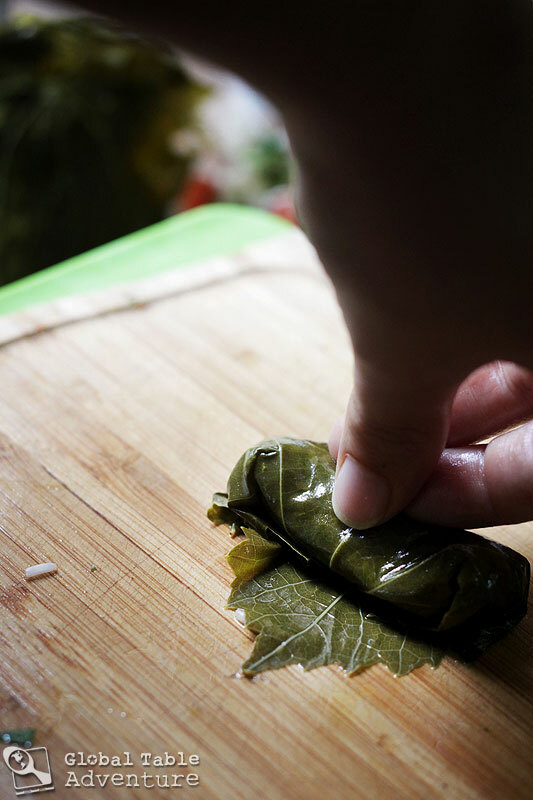 Then add the lemon juice and cook an additional hour (or to taste)... you’re looking for the rice to be tender inside of the grape leaves… (cut one open to check). I've seen several recipes cook them for upwards of three hours, so don’t despair if yours needs longer. Arrange them on a plate (this is about 1/3 of them) and pile some of the lemony potatoes in the center. Garnish with the cooked and sliced tomatoes, as well as a few olives. PS…still have not seen the heart dress…this plaid one fits at last…looks good. Thanks mom…. We’ll put it on soon! It really is cute. Congratulations for finally getting Ava to try the grape leaves! 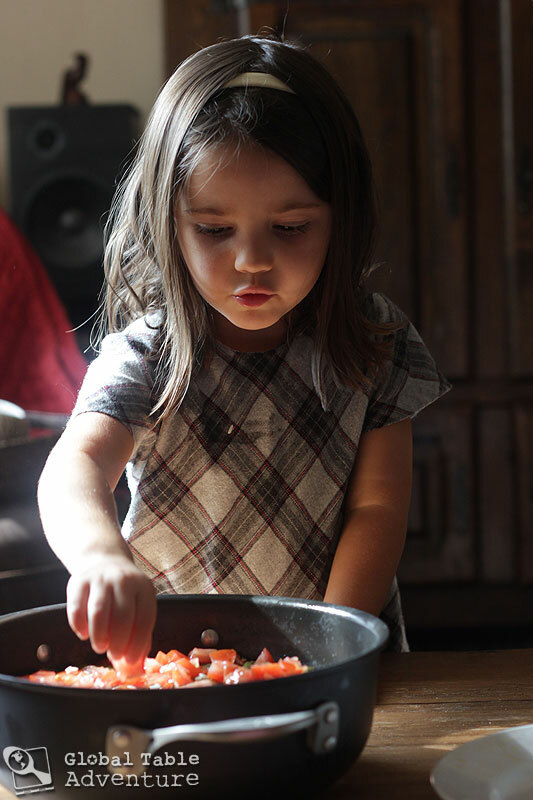 There’s definitely a lot to be said for getting kids involved in the cooking process. I used to volunteer for the Stephanie Alexander Kitchen Garden program in Australia and the kids were always more willing to try foods they’d helped cook – even curries or dishes with brussels sprouts! 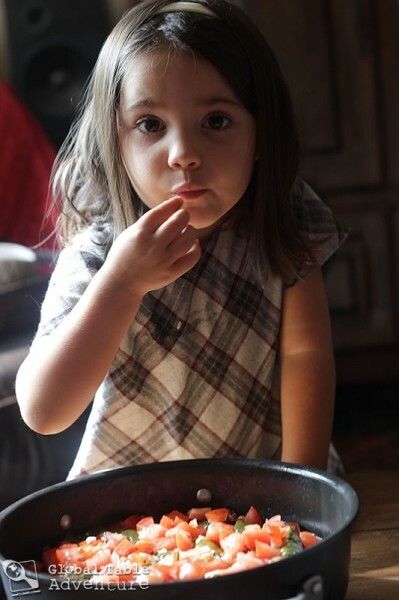 Ohhh, I need to do this with brussels sprouts… I’m the only one in the house who will touch them. How did you have the kids prepare them? Aw, shucks 🙂 Thanks for the music, too. I must say – I think that I would really like these! 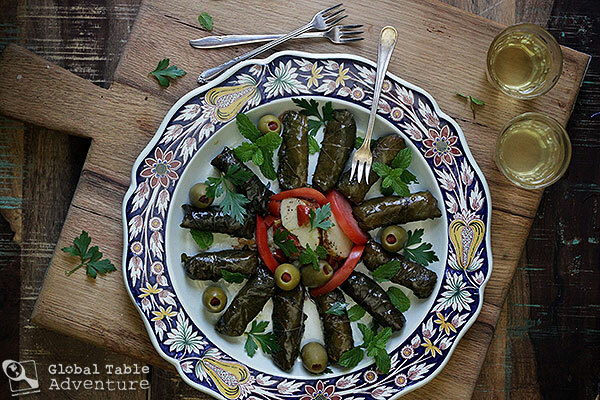 I thought I liked stuffed grape leaves until I made them… then I loved them! The flavors are so bright and just a world apart. Wow, a really great and healthy recipe. Must try it. I am so glad I stumbled upon your﻿ website. 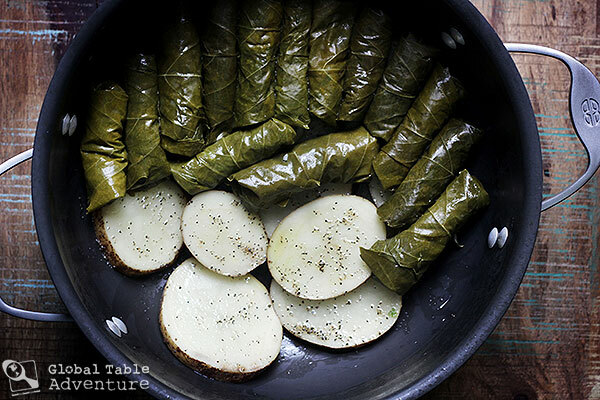 I will be trying your stuffed grape leaves recipe this week for my husband. He is from Jordan and Saudi Arabia, and I want to try to make food, on occasion, that is reminiscent of his childhood. I absolutely love this recipe! I have been blessed to eat this amazing stuffed grape leaves in Egypt, cooked by a local family and I can´t describe how much I have been craving to taste them again. And nothing can beat homemade stuff! I don’t think you mentioned that if you use grape leaves from a jar, you have to not only rinse them well, but also gently boil them for a few minutes and then cool them, before using. You also need to cut off the stem of each before stuffing them.